In Philadelphia, good defenseman are hard to come by and that is no secret to anyone who follows Philadelphia Flyers hockey. And making the best impression you can on management can lead to a big contract in the end for certain defensemen and that is exactly what Nicklas Grossmann has done. Acquired shortly before the February trade deadline, Grossmann took all of 22 games to show he was worth a long-term investment — which the Flyers reportedly gave him on Friday. The 27-year-old Swede inked a four-year, $14 million deal ($3.5 average annual cap hit.) and this deal is reportedly worth double his previous cap hit. 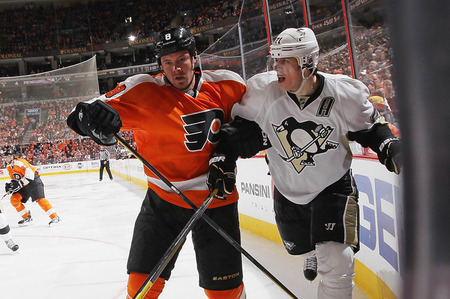 Grossmann also has given the Flyers a more physical defensive presence. He is easily the club’s best crease-clearer. He is also a tenacious shot blocker. Grossmann came here with 100 blocked shots from Dallas and has 52 as a Flyer. Grossmann would’ve been an unrestricted free agent at season’s end, which could explain why Flyers GM Paul Holmgren was quick to sign him. Philly was also likely keen to extend Grossmann given Chris Pronger‘s playing future is cloudy at best and Matt Carle — Philadelphia’s second-leading defenseman scorer — is 27, an unrestricted free agent and believed to be seeking a raise from his current deal ($3.44 million annually.) and yet, Carle may not be in a Flyers uniform at the start of the 2012-2013 season. Speaking of raises, this deal represents a significant one for Grossmann, who’s last contract in Dallas was a two-year deal worth $3.25 million ($1.63 million per.) and I would look for the Flyers to try and ink Kubina prior to the end of the 2011-2012 season as well with all the uncertain future of Pronger and Carle.